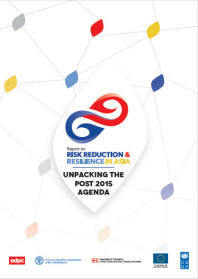 This report on “Risk Reduction and Resilience in Asia: Unpacking the post 2015 Agenda” reflects the views, commitments and interests shown by individual practitioners’ who attended the 8th Practitioner Workshop in Bangkok during 23-25 November 2015 . This is the continuation of practice of knowledge exchange among disaster risk reduction practitioners in a range of issues that are relevant to community resilience, local and regional networking and global frameworks. At ADPC, we are creating a sense of responsibility inside the community, among our partners, within our institutions and in our governments on disaster risk and resilience building with a few high risks to miss reaching our final destination in 2030 .